We get a lot of questions at Sparx about deburring; How is it done? What stones should I use? How do I get rid of a stubborn burr? In this post, we’ll cover the basics of deburring when using the stone and strop included with our Sparx sharpeners. We will also cover in detail what the pros use, and how they go about removing burrs of all kinds. If you own a Sparx, typically, 4-8 passes using the included stone and strop will remove most of the burr left behind from a sharpening (see how-to video here). Occasionally we encounter a burr that feels like it just cannot be removed with the standard amount of deburring, we call this a stubborn burr. While frustrating to deal with, stubborn burrs are fairly common and should not cause concern. 1. Certain types of skate steel (and skate steel coatings) are more (or less) prone to stubborn burrs. Skate material is, in our experience, the greatest contributor to stubborn burrs. Some skate steel produces a very consistent and negligible burr while others, all other factors being equal, always seem to have a more significant burr after sharpening. We believe the hardness and composition of the steel itself (and coating if applicable, e.g. black steel) is what dictates the size of the burr. Interestingly, we have found that steel from the same "family" (e.g., Bauer LS2) can produce different results from blade to blade; meaning one blade may produce a small burr and another supposedly identical blade may produce a larger burr. This inconsistency is most likely due to variations in the batches of the steel when it is manufactured. 2. The amount of sharpening being done, all other factors equal, is also a factor for burr size. Fewer passes/cycles will create a smaller burr. Simple as that. 3. Finally, sometimes a burr isn't as stubborn as it seems. Sometimes a burr can appear stubborn because our honing stone needs to be refreshed or replaced. Stones lose their efficacy because the abrasive surface of the stone gets compromised by embedded metal and debris. Try refreshing the stone using a fine, soft wire brush and honing oil. Make sure that the face of the honing stone is always perfectly flat without any grooves or depressions in it. We recommend replacing the stone when it gets worn. How do professional skate sharpeners handle stubborn burrs? (Pictured above) An NHL equipment manager’s honing stone assortment. As you might suspect, skate sharpening professionals have different opinions on the process of deburring. 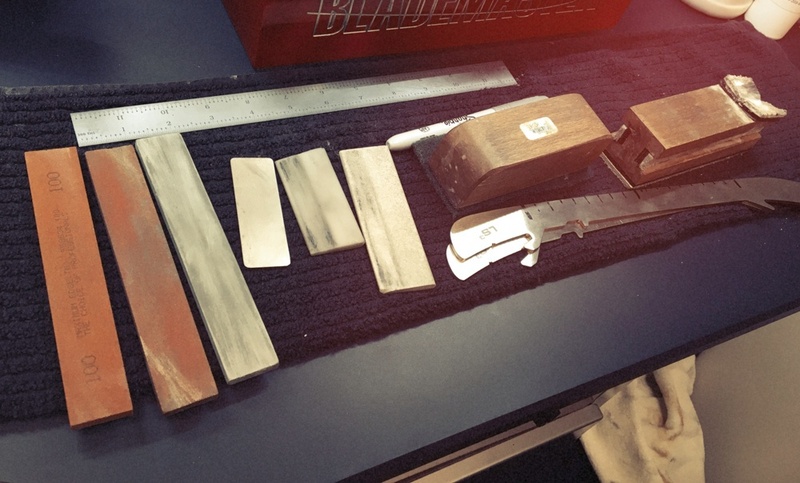 Most professional skate sharpeners usually have an assortment of honing stones (see picture above). These stones typically range from 100 grit (very coarse) to 800 grit (very fine). Harder and finer deburring stones often work better when removing stubborn burrs. 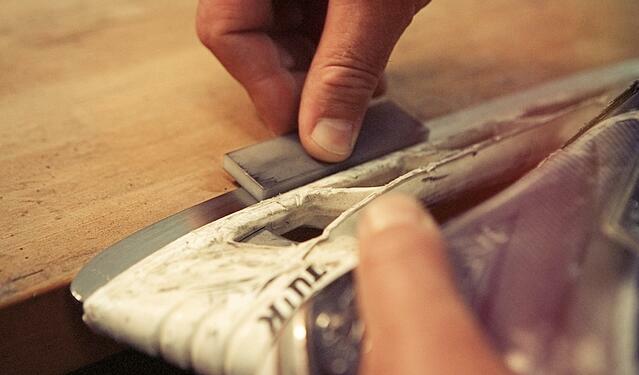 A small number of professional skate sharpeners are reluctant to perform more than the standard amount of deburring. They believe that extra deburring isn't necessary since small burrs are undetectable by the skater (we’ve tested this, and we’ve never been able to detect a small burr while skating). 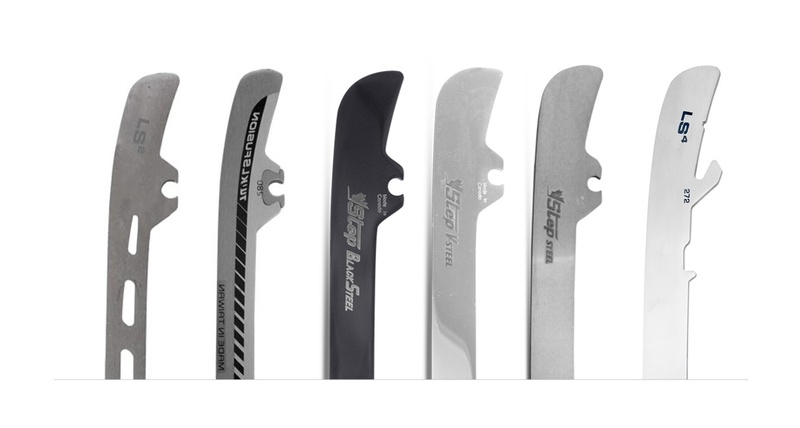 In their opinions, excessive deburring will remove more steel than desired from the face of the skate blade. We have however found that the majority of pro skate sharpeners go to great lengths to remove the burr from the edge. These sharpeners will assess the burr and the steel type and then choose the best honing tools for the job. Usually, their approach to removing the burr (stubborn or otherwise) includes a series of passes using several different honing stones. They will begin with the most coarse (e.g. 100) and finish with the finest (e.g. 800). We recommend having a few different honing stones at your disposal as well. The coarse 100 Grit honing stone is used to address larger nicks or aggressive burrs that can be created while removing a lot of steel at once. While not considered a requirement for proper deburring, this stone can help expedite the process when faced with a heavy burr. A good first honing stone for your kit is either the basic white honing stone supplied with Sparx (240 grit, white corundum) or the Premium India Bench Stone (240 grit, aluminum oxide) available on our website. While both of these have the same grit number, they have a slightly different feel and, depending on your preference, you may favor one over the other. A lot of professionals prefer the Premium India Stone for its size (4” x 1”). Following the 240 grit stone is the Fine (320 grit) India Premium Honing stone. This stone offers further refinement in the edge deburring process. 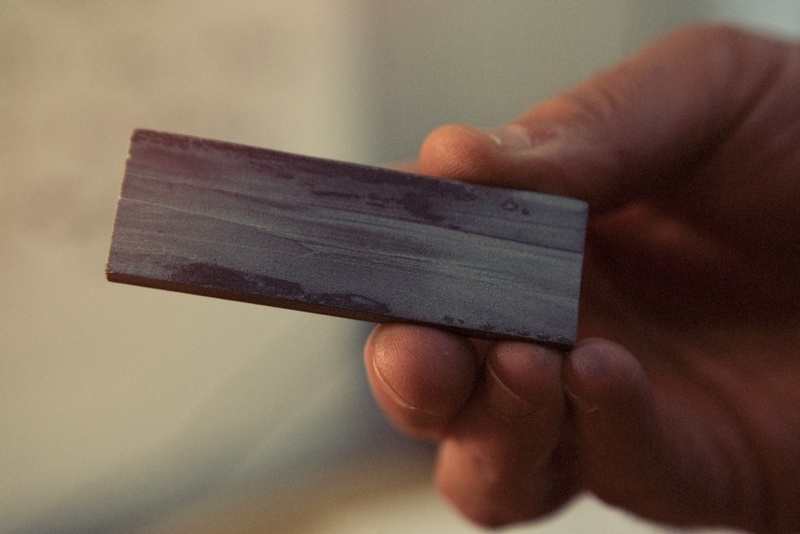 Just like a good knife sharpening, you don’t jump to the 320 grit stone before working your way up with the others. Many professionals will use this after their medium grit stones to remove any lingering fine burrs. 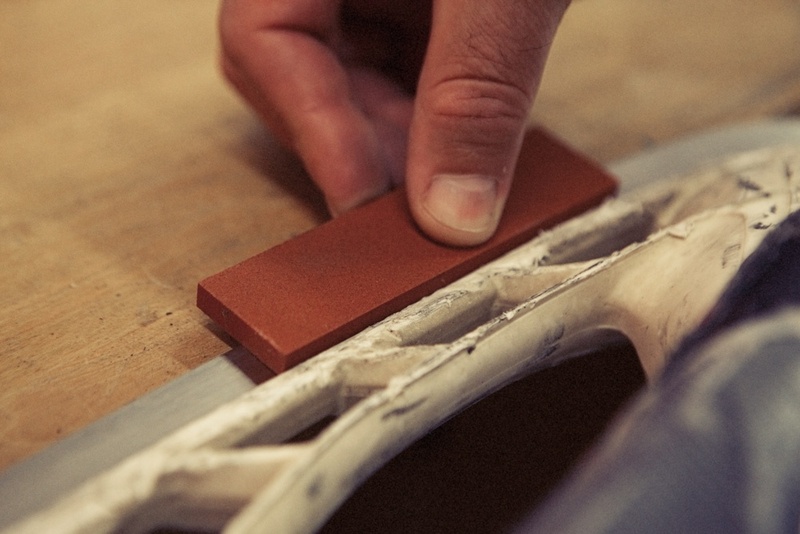 Once this initial stone deburring is complete, running a leather strop down both edges of the blade will remove the remaining residue and leave the blade smooth and polished. (see the Sparx deburring video here. Need to go the extra mile? For 99% of skate blades and skaters, this should be an acceptable amount of deburring. If, however, a burr remains after this standard approach and you would like to continue working on it, we recommend a much harder stone such as a Hard Translucent Arkansas Bench Stone. Locally working out a stubborn burr (i.e. more passes in a small area of the skate steel) with a very hard (e.g. fine) stone is sometimes the only way to remove them. This Arkansas stone, we learned, is the go-to stone for some of the best skate sharpeners in the business. In all deburring operations, try to keep the face of the stone pressed firmly against the face of the skate blade. Some skate sharpening professionals do occasionally tilt the stone at a slight angle to the blade (approximately 10 degrees or so) for certain deburring situations, however we rarely use or recommend this approach. We recommend having a few different deburring stones available and experimenting with them. It has been our experience that every NHL equipment manager has their own unique deburring strategy. Not surprisingly, all of the different strategies use generally the same tools in roughly the same order as the Sparx deburring strategy described above. For a stubborn burr, do your best to remove it and then make a few passes with the leather strop. If you want to do further work on a burr, experiment with harder/finer stones. Finally, burrs, especially small ones, are not detectable by the skater. Make sure you don't obsess over them. Happy sharpening!